MyTechReports (MTR) is optimized to streamline across desktop as well as mobile platforms. What is MyTechReports and how the service can be leveraged as a sales tool? 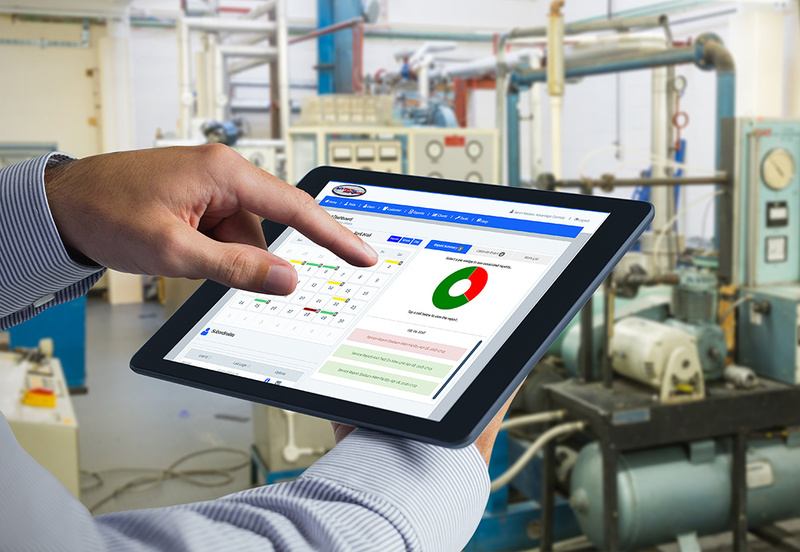 MyTechReports (MTR) is a cloud based reporting Software as a Service (SaaS) designed by water treatment professionals, for water treatment professionals. 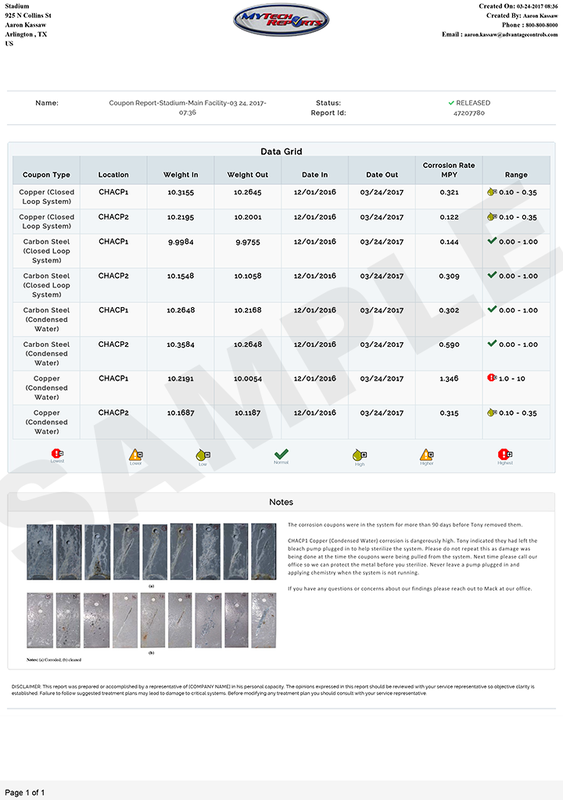 Water treaters and their customers are able to save lab results, controller data, provide graphing, and store documents such as inspection videos, training material, and SDS/PDS sheets, etc. all from one location. MTR was designed and built in our Muskogee, Oklahoma plant and is maintained by in house engineers. Each account is given their own unique URL and database. Advantage Controls provides unlimited training for company admins and scheduled training for service technicians and end users. System admins are shown how MTR can be leveraged to enhance your company's sales and water treatment program. 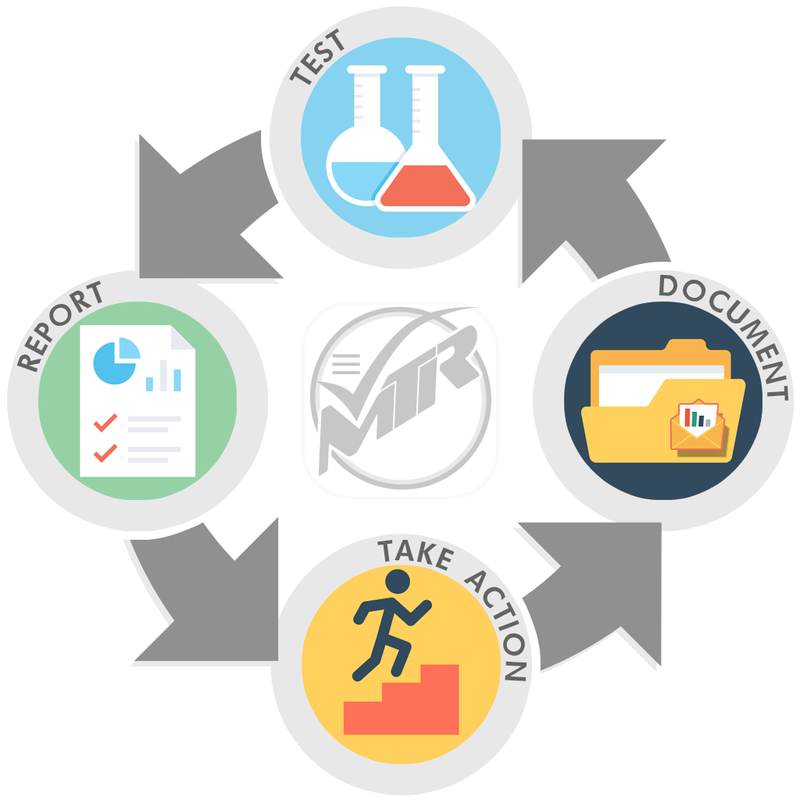 MTR is commonly used to keep customers informed of their account operations, collect mission critical data, and provide beneficial access for plant operators, lab technicians, and management personnel. If you've ever lost your computer, phone, laptop, or tablet you understand that your whole world lives on that device. With MTR, you can access your data and information from virtually any web capable device. All the data is backed up daily with an uptime of 99%. Administrators will have control over how end users access the system. 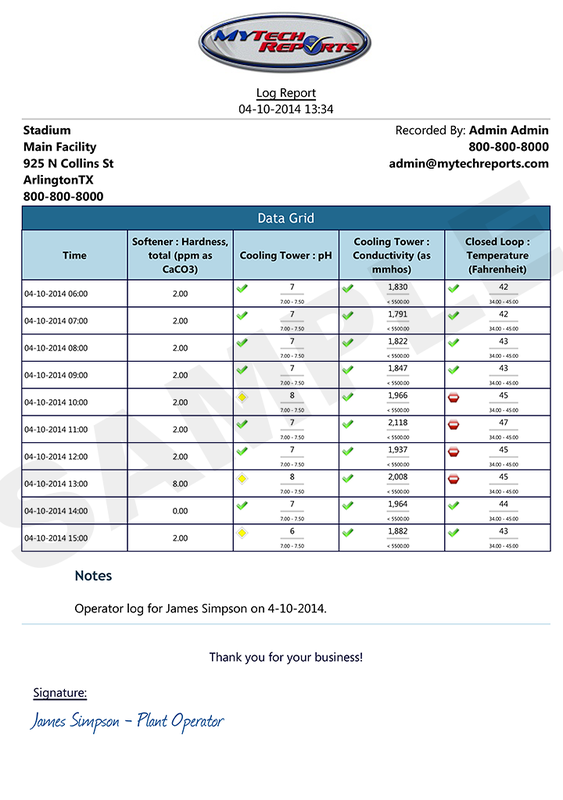 Enable read only mode or allow plant operators to enter their own data and checks. If you manage a large multi-facility account you can assign multiple users to the same account and system units. 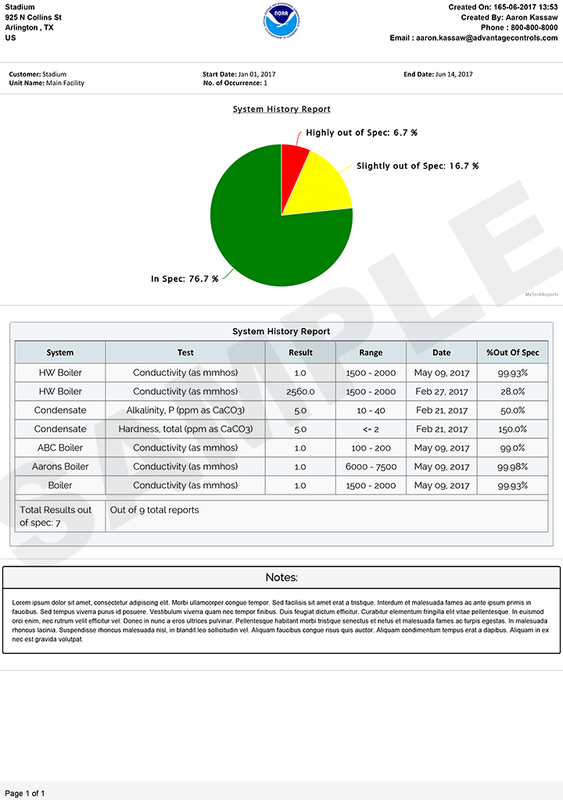 Administrators are able to view a report summary page from the dashboard, showing the severity of out of spec results with the most extreme always at the top. 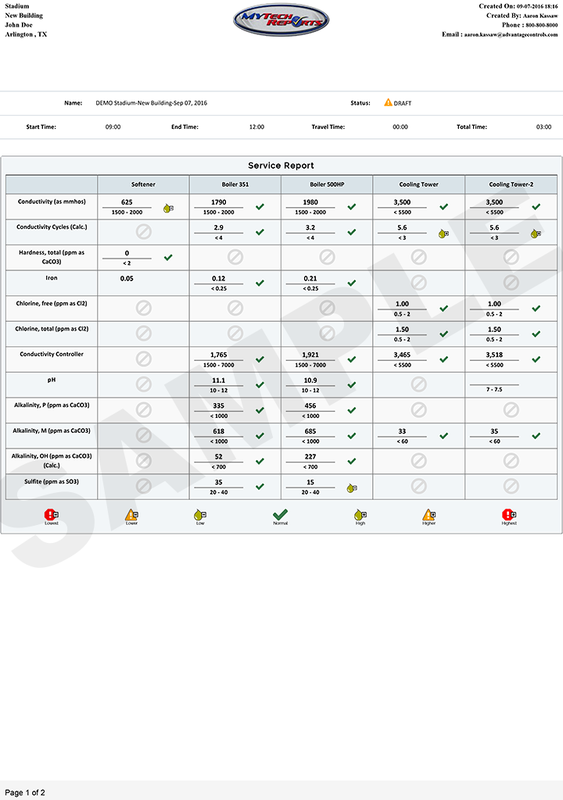 SaaS (Software as a Service) - As long as the customer is with you they have access to the system to review reports, chart / trend, download Safety Data Sheets, Product Data Sheets, and input Operator logs and reports. Cloud based - No software or IT headaches. Just connect to a website and enter your data. Community Feedback Driven - Your voice is important and so are your ideas. Some of the best ideas we implement have and still do come from our customers. Let us know how we're doing! 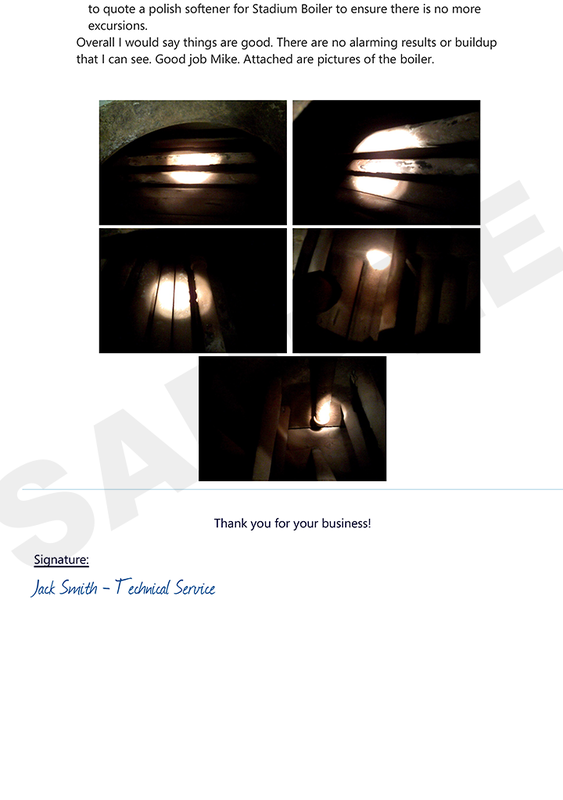 MyTechReports (MTR) can help your company be in compliance with ASHRAE Standard 188, which establishes the minimum legionellosis risk management requirements for building water systems. Standard 188 is essential for anyone involved in design, construction, installation, commissioning, operation, maintenance, and service of centralized building water systems and components. Using MyTechReports cloud storage you and your clients can store and have 24/7 365 access to your Site Plans, methods of monitoring, sampling points and records of testing results or maintenance. MTR offers the most features for the price vs. any competitor. Constant ongoing development and improvement. Your data is your data. If you choose to leave we can give you a CSV with all your data to take with you. Unique user roles - only see what you want others to see. System and Customer reviews built in. Saves you time and money. Mobile friendly website and iOS/Android APP available. M-F 8-5 Support available for System Admins. MTR setup takes just a few hours vs. days thanks to our customer importing. Change test ranges, add tests, and remove tests on the fly. Push notification for the mobile APP. Know the jobs are getting done. *User is defined as someone with read and write access to more than one customer within your account. **Each customer's requirements are different and could affect pricing. Request a demo for a firm quote. 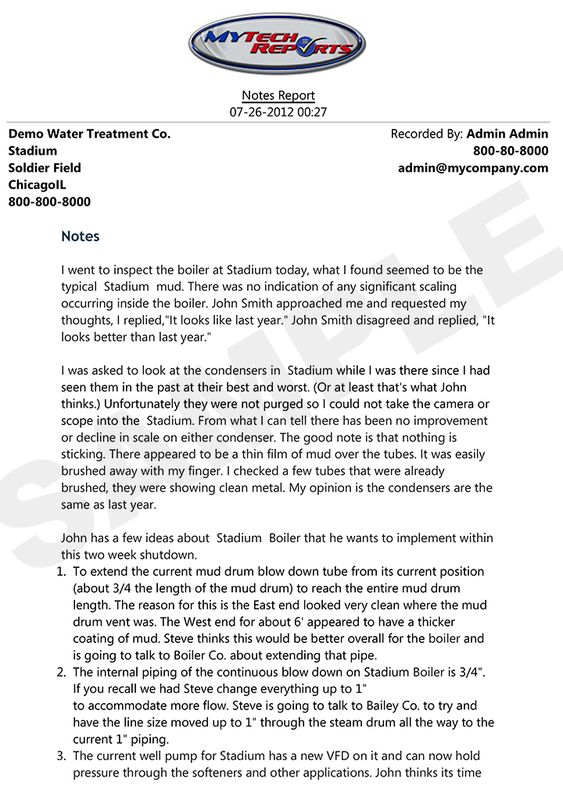 "The most asthetically pleasing and easy report to read I've ever seen." "Easy to setup. Easy to keep track of service visits and results." "My customers use MTR every day. I know I can log in and see how the plant is running 24/7!" Contact us and we'll get back to you within 24 hours with free trial information. To access the application, you must log in. Please enter your username and password.